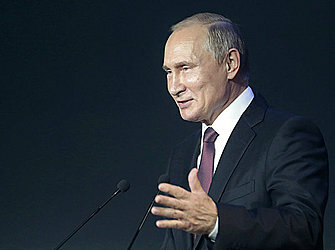 Addressing a cybersecurity conference in Moscow, Putin said it's important to develop common cybersecurity standards that take into account interests of all nations. He noted that cyberthreats have mounted around the world. "Cyberthreats have reached such a scale that they could only be neutralized by combined efforts of the entire international community," Putin said. "We have repeatedly seen that some nations' egoism, their attempts to act squarely to their own advantages, hurt the global information stability," he added without specifying. The Russian leader didn't address allegations that government-sponsored Russian hackers have meddled in the U.S. 2016 presidential elections. Moscow has strongly denied interfering in the vote.